Stephen Elliott, Jr. (1830-66), Brigadier General, CSA (SC). Ft. Sumter, Port Royal (WIA), Pocatalico, Ft. Sumter Commander (1863-64), Petersburg campaign including "Crater Affair" (WIA), Bentonville (WIA). War date cover (envelope) addressed by him to mother as Mrs. Stephen Elliot, Camden, SC with 5 c Davis stamp (Scott 4) postmarked Charleston, SC 5/11/(62). 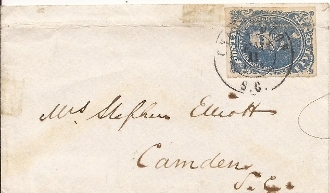 Fine and scarce autograph.